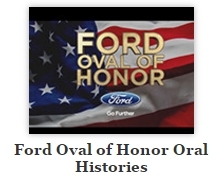 The Ford Oval of Honor Oral Histories collection contains videos and transcripts for oral history interviews with local World War II, Vietnam War, Persian Gulf War, and Iraq War veterans between 2013 and 2016. The interviews were conducted by Chris Reidy of WIPB-TV as part of its Oval of Honor award series sponsored by the Ford Motor Company. Also included are annual Ford Oval of Honor programs about the award recipients for 2013-2015.